The Cannes International Film Festival has come around once again. The Cannes International Film Festival has come around once again. As a prestige film festival that selects diverse and artistic films from all around the globe, it allows attendees to catch the trends of world cinema at a glance. So which Korean films can be seen at the renowned festival? In the Un Certain Regard section, OH Seung-uk's The Shameless and SHIN Su-won's Madonna were invited while HAN Jun-hee's Coin Locker Girl is going to la Semaine de la Critique. In the Midnight Screening section, newcomer HONG Won-chan's Office was invited, bringing Korea's Cannes delegation for this year to four. Here is an introduction to the Korean films that you will be able to watch this year on the Croisette. The Shameless is a new film directed by OH Seung-uk who wrote the screenplay of Christmas in August (1998) and debuted as a director through Kilimanjaro (2000). ‘Queen of Cannes’ JEON Do-yeon, who picked up the Best Actress Prize at the 60th Cannes International Film Festival for Secret Sunshine (2007) and later served as a juror, will visit the festival for the fourth time. The Shameless is a film of many contrasts. 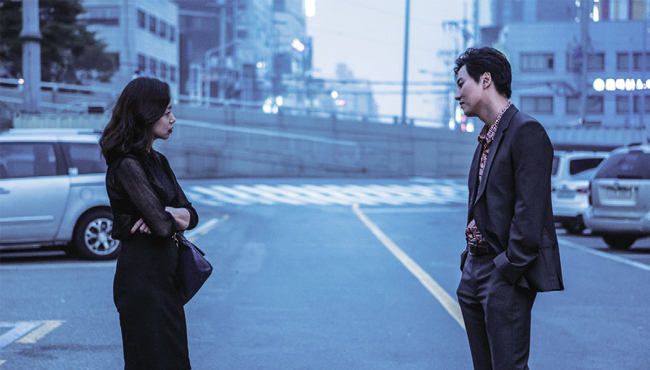 OH Seung-uk who showed a truly Koreanstyle noir through Kilimanjaro, has returned with a melodrama. The film is a hardboiled drama featuring a cold-blooded cop who wants to achieve his goal by taking advantage of the girlfriend of a killer, but ends up taking an interest in her. JEON plays the waitress KIM Hye-gyeong whose lover absconds after killing someone, while the cop who infiltrates KIM’s saloon in search of the killer is played by KIM Nam-gil. Director OH defines the word ‘The Shameless’ as those who carry out both good and evil things to obtain what they want. The film will tell a story of two do-or-die people after they meet at the end of the world. OH Seung-uk - "I studied the rules of those at the bottom of society"
The Shameless was invited to Cannes. How does it feel to be a director whose film will be shown in Cannes? Good luck crossed my mind. I was finally able to pay back to those who helped me make this film with its seven-year-old script. I am happy that their efforts were duly rewarded. How would you introduce The Shameless to audiences in Cannes? There is a man who is more of a hunter than a cop. He has lived in his own way while ignoring the order of the world. But he began to change sentimentally and ethically after meeting a woman. What made him change that way? What does he do after his change? Who is the woman who changed him? What do the man and woman suffer from? This film is about these questions. After Kilimanjaro, you focused on writing screenplays and adaptations for fifteen years until you came back to directing with The Shameless. What made you not only write the script but also direct the film? Scripts are always intended to be made into films. As not all scripts are made into films, I write them at the request of friends or acquaintances. Involuntarily, my directing hiatus was extended. How did you come up with the concept of the love between a cop and a murderer’s lover? The theme itself is not that exceptional, it’s actually more on the stale side. There are so many films of this kind. Since I was young, I have loved Jean-Pierre Melville’s films. I wanted to make a film with a focus on the relationship between a cop (Alain Delon) and the lover of a crook (Catherine Deneuve) like in Un Flic (1971). This desire made me start working on the film. Another reason is that I wanted to express fear and a sense of guilt behind the rough and violent attitudes of men, including me, against women in the film. The Shameless belongs to the hard-boiled melodrama genre while Killimanjaro is a typical film in the noir genre. You seem to have affection for genre films. What part of them attracts you? I admire Hollywood westerns, spaghetti westerns and French crime films. I love and think highly of films where rough and tough guys gradually fall like submarines on the blink that sink into the deep abyss. After hitting Cannes, the film will be released in Korea. What part of the film do you want audiences to pay attention to? I put my utmost efforts into depicting those at the bottom of the social order who cannot survive unless they are tough enough. I hope viewers will take this into consideration.